â€œâ€¦.He said to them, â€˜Let the little children come to me, and do not hinder them, for the kingdom of God belongs to such as these. Truly I tell you, anyone who will not receive the kingdom of God like a little child will never enter it.â€™ And he took the children in his arms, placed his hands on them and blessed them.â€ Mark 10: 14b-16. It is with a verse like this in mind that I reflect on a recent trip my family took to minister alongside Paso a Paso and the work Stephanie Cady is doing in Guatemalaâ€¦. I had no idea what to expect from Stephanieâ€™s six year old bilingual daughter advertising door-to-door about the first childrenâ€™s Vacation Bible School (VBS) to be held in the severely impoverished community called Cerro el Nino, outside of Antigua, Guatemala. I had no idea how a blind pastor, one devoted missionary woman, her three children and my family of four who barely speak Spanish could host a VBS. I had no idea how my two daughters, Marin (7) and Brooke (5), would react on their first trip out of the country and exposed to the realities outside of the suburban lifestyle in which they are raised. I had no idea how God would humble my family over the 10 days last April. We witnessed the amazing work of â€œMiss Stephanieâ€ and Paso a Paso Missions as we shared Jesus with over 120 of His children. My wife, Bethany and Stephanie planned a four day VBS focused on the seven days of creation utilizing Scripture memorization games, worship songs, crafts and a Bible lesson from Pastor Rolando. 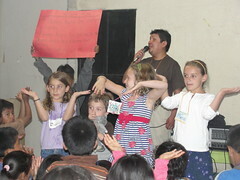 Our daughters and Stephanieâ€™s children helped prepare the crafts, create their own hand motions to the Spanish worship songs and assisted in managing 60 to 120 children each day. On the first day, I was thoroughly impressed to see all these children who were as young as two years old and big sisters with their infant siblings sit on a floor and give their full participation to a strange man teaching them about the God that created them. Even a stray dog and a wild chicken wanted to hear the good news! While helping the children with their crafts, I was surprised by the number who couldnâ€™t write, draw or use scissors. 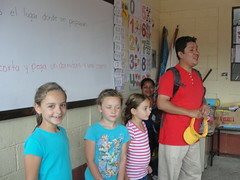 As I praised the children for their work, I realized that a simple â€œvery goodâ€ or â€œvery prettyâ€ actually meant something to them. After each step of the craft was completed, they asked for affirmation as if it was something very rare for them to hear. 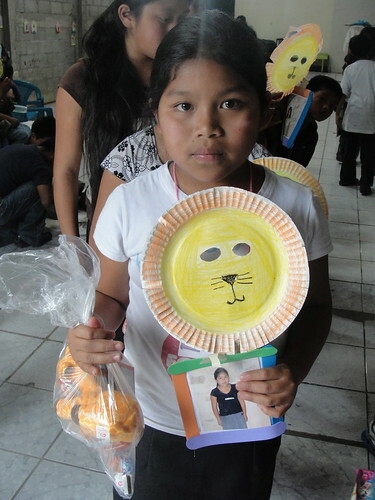 When the children left each day with their craft depicting the days of creation, they were quizzed on the Bible verse for the day and discretely evaluated by Stephanie for any special needs Paso a Paso could meet for them. 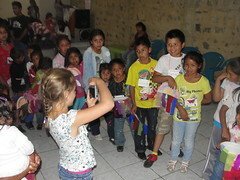 Paso a Pasoâ€™s mission is to provide scholarships for children to attend school and support to these childrenâ€™s families. It was sad to witness a mother inquire about helping her family yet then be unable to accept it due to her husbandâ€™s mistrust of Christians. In contrast, seeing more and more parents each day come and participate in the VBS with their children was very encouraging. It was also impressive to observe how well Stephanie managed Paso a Paso resources of school supplies, shoes, food items and funding to ensure they were distributed fairly and to where they could best be utilized. To be honest, I had some selfish reasons for bringing my family to Guatemala. 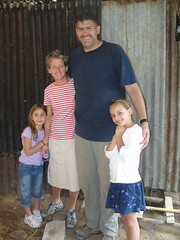 I wanted my daughters to see how many of the worldâ€™s children live and challenge them to serve in a foreign environment. They impressed me more than I ever expected. I will never forget the joy I felt witnessing Marin and Brooke standing on stage in front of dozens of Guatemalan children leading them in worship in Spanish! I, again, was overwhelmed with gratitude while going door-to-door (shack-to-shack) in a barrio on the side of hill asking children to come to the VBS when around the corner my daughter Brooke comes running, hand in hand with three Guatemalan girls. Without any fear or hesitation, they were going to random dirt floored homes made of sheet metal and branches asking if the children wanted to come hear about Jesus. I believe this is the type of faith Jesus was talking about in Mark Chapter 10. Stephanie planned our trip perfectly which also included visits to the Portico del Cielo church and church staff in Barrio la Cruz where Paso a Paso focuses their main ministry efforts. Our time with Pastor Rolando and his family was very special. He helped coordinate a small building repair project where we constructed a wall and roof of a church memberâ€™s home with sheet metal, bricks and plastic. On our last day, we hiked the top third of a 9,000 ft active volcano of which the highlight was roasting marshmallows on a steam vent at the top! I knew at the end of trip that Paso a Paso and Stephanie touched our lives just as much or more than we did the Guatemalan children when Marin said she wanted to be like Miss Stephanie when she grows up. I could not be a more proud father and was so thankful to see Stephanieâ€™s family just â€œbeing Jesusâ€ to those in need. 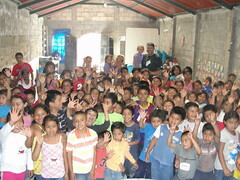 If you are interested in learning more about the amazing work Stephanie is doing with Paso a Paso Missions in Guatemala, please visit her website at http://www.pasoapasomissions.org/. Her work is only limited by the support we can provide her. I know you will be blessed, as we are, for any prayer, financial support or short term project participation you can provide to Paso a Paso.